"I got bit by the (flying) bug. When I got down, there was no way they could keep me on the ground." The youngest of 6 children, Ethel Louise was born on January 20, 1921 to Ralph and Carrie (Auer) Jones. Growing up on her parents' farm in Heyworth, IL, she spent her time outdoors, doing farm chores and enjoying nature. In 1936, Ethel saw an ad in the paper about sightseeing airplane rides given by the Hunter Brothers. She spent $1 on that first flight, and always remembered seeing the fields and corn being detasseled from above. After a single flight, "I got bit by the bug. When I got down, there was no way they could keep me on the ground." She worked several jobs to save money for flight lessons and took her 1st lesson on July 23, 1942. When the Women Airforce Service Pilots were formed a year later, she had already logged 173 flight hours. She applied and was accepted into WASP training, paid her way to Sweetwater, Texas and arrived at Avenger Field, in December of 1943 as a member of the WASP training class of-W-5. After completing seven months of Army Air Force Flight training, Ethel and 71 of her classmates graduated and earned their silver WASP wings. Ethel received Army orders to report to Gunter Army Air Field in Gunter Alabama. There, she flew engineering test, utility, and administrative flights as well as instrument flight instruction until the WASP were disbanded 20 December 1944. She would log over 500 hours in the next year. During that time, she would have flown BT-13's, AT-'6's, AT-10's and UC-78's. 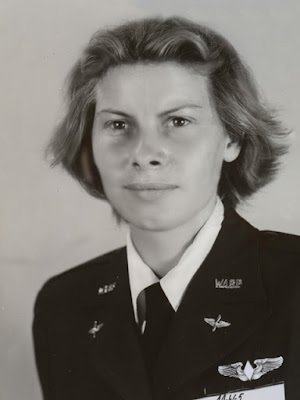 Following her military service, she continued as a flight instructor and charter pilot at airfields in IL, NJ, and TN. She was a role model for many aspiring pilots, male and female, who continued on as professional as well as recreational pilots. In 1950, she was invited to vacation in Sao Paolo, by friends who were living in Brazil. A blind date led to marriage to Ira Sheffler, and she remained in Brazil for several years. Their first daughter, Sue, was born in Brazil. By 1953, the young family had moved to central NJ, where daughters Sandy and Linda were born. In the mid-1950s, Ethel became the 7th woman in the world to obtain her helicopter rating and is a charter member of the Whirly-Girls. Traditional expectations restricted her ability to fly openly, but she still flew secretly. She wrote a piece she called "Homesick Angel" about feeling stranded from her passion, flight. In 1960, she threw off the bonds of tradition and returned to flying full time as a chief instructor and charter pilot while raising her 3 daughters. She also worked at a printing shop to support the family. "She used her skill, passion and free access to planes to teach each daughter to fly - in fact, we were not allowed to get our driver's license until we had our pilot's license." In 1972, she returned to the Midwest, based first at the airport in Galesburg IL, followed by a few years in Columbia TN, and finally in Bloomington IL. Upon retiring as a flight instructor at the age of 83, with over 25,600 flight hours, she moved to Appleton WI to be closer to her daughter, Linda. Over her years as a pilot and as an adventurer, she flew to 49 states (all but Hawaii) and traveled to all 7 continents. Ethel Louise Jones Sheffler died on June 5, 2018, surrounded by family. "We will miss our humble, strong-willed, independent, curious, nontraditional mom. She raised us surrounded by books, nature and a wide variety of music. As often as she could, she took us on adventures to woods and gardens, historical sites and factories to see how the world worked." She was an active Girl Scout leader, 4H leader and volunteered at the local mental health facility. In Appleton, while she was able, she volunteered at the Paper Discovery Museum and Northeast Wisconsin Land Trust. Ethel is survived by Sue Sheffler (Rob Meier) and their children Andrew and David Meier and Justine Sheffler, Arlington, MA; Sandy Sheffler (Mike Dooley) and children Joylyn and Alana Cordak, Woodstock, GA; and Linda Sheffler (John Thompson) and children Skylar Thompson (Carrie Berg) and Lauren Thompson of Appleton, WI. Ethel chose to donate her body to the Medical College of Wisconsin to contribute to the knowledge and skills of doctors. At her request, there will be no public service. "A tremendous Thank You, from our mom and her family to the staff at the Heritage and most especially the CBRF for your kindness, care, compassion and friendship to our mom. Life wasn't always easy, but it was always interesting. May you return to the wide open sky that you love." ______________________Quotes from Ethel's daughtersOriginally published in Appleton Post-Crescent on June 10, 2018Respectfully edited and posted with additional WASP information and photo by Wings Across America. May God bless this high-flying, inspirational WASP and all of those touched by her passion to serve and to soar.